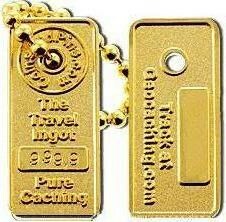 (TB2EV9P) Travel Ingot Geocoin - Stolen!!! Todie's Wild Ride: Cars are not toys! Stolen!!! Todie's Wild Ride: Cars are not toys! Use TB2EV9P to reference this item. This coins purpose is to remind everyone that cars are not toys! Too many people nowadays think that their 2 ton car is just a toy. They drive them like they are invincible and have little regard for other users of the roads. Some drivers think that they will be able to walk away from any accident, no matter how big or how small. Unfortunatley most accidents involve some injuries no matter how big or small. The worst part about the attitude that a car is just a plaything is that usually the driver who think their car is a toy doesn't get hurt very badly, it is the driver of the other car, the motorcycle rider, the bicycle rider, or the pedestrian who gets hurt the worst (and sometimes they even get killed). So remember when you are out there driving your huge car that it is not a toy, but a large piece of dangerous equipment and that it has the capability of seriously injuring or even killing an innocent person. Gallery Images related to Stolen!!! Todie's Wild Ride: Cars are not toys! Found this coin in Classic Cache. I already had my hands full of other TBs, So I am discovering it. I too agree with cars and cyclists of all kinds. Hope we all can get awareness out and all be responsible drivers too.